Br. Abid, While I am not aware of vectors, this is what I could decipher from the diagrams. 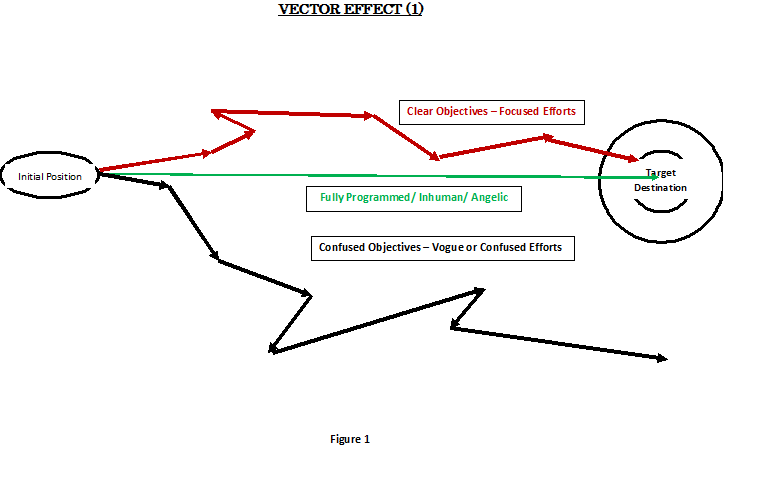 and black lines denote the results of two approaches that we take. developed with different set of objectives in mind. objective – but simultaneously not anywhere close to our desired objective. desired objectives – not even close to that. Jazak’Allah Br. 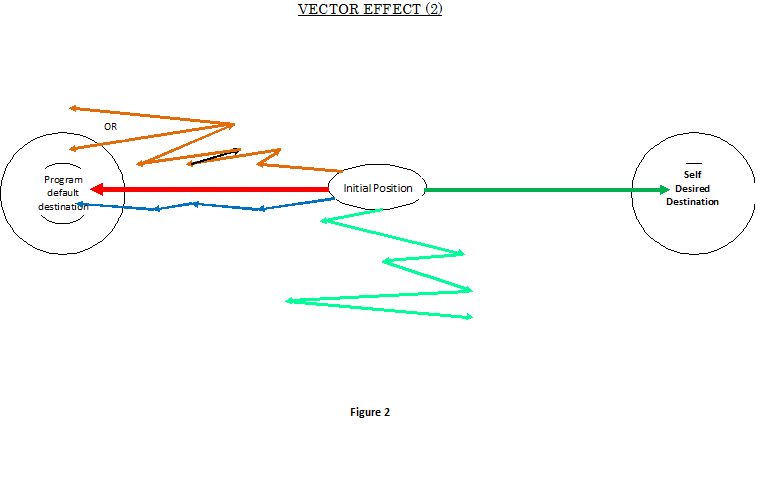 sorry for the delay in responding, considering you have not done vectors in your education your representation of the diagrams is Masha’Allah quite elaborative. I did vectors in my matriculation or Inter and I was amazed at its relevance to many of the Islamic concepts which Insha’Allah we will be discussing in the next few e-mails. They represent a lot of principals referenced to in Qur’an. Like effect of good-deeds and bad-deeds; the establishment of meezan (the scale) on the yom e aakhira (last day of judgment); the law of recompense (the affect of sawab [good deed] and gunah [bad deed] ), and especially the law of cause and effects. Simply put in mathematics and Physics the vectors are used to calculate the resultant of all activity which has a direction and magnitude (is measurable) Suppose there are say ten different difference forces acting from different directions, the resultant will be the final outcome of the forces. Since the forces were acting in the different directions the result will not be simply the adding up of the forces. 1) Allah’s law of cause and effect is a powerful natural law which is universal and quite impartially implemented on all. Be it Prophet or a common man, saint or a sinner. This is the law under which a Prophet too falls sick or is cut into two by an axe (astaghfrullah) . The Prophet may peace and blessings of Allah be upon him, lost his tooth in the battle of Uhud and was injured. He suffered the pain of being poisoned by a Jew lady, etc, etc. every effect has to be preceded by a cause. It also goes, ‘you will only reap what you sow’. Things do not happen by themselves. I am writing all this to make my audience realize that if we want to bring any change it has to be preceded by equivalent preceding efforts. We Muslims wish and aspire very high but are quite short on logical efforts. We wait for nusrat (help) from Allah’s without exerting ourselves logically and appropriately. But the vector theory says otherwise. The resultant will be proportionate to the qualitative appropriateness ,or the magnitude (sincerity and intensity of efforts), and the direction of efforts. For example, as I always remind, if the ladder is on the wrong wall no amount of efforts will make us reach the correct desired destination. Please refer again to the above figures.